Peisk lake is known for its trophy walleye and there is one additional lake to fish by navigating a two-mile channel. Mimi lake is known for its abundance of walleye and trophy northern. The portage lakes accessible from Mimi provide near guarantees of catching a Trophy Northern in an afternoon of fishing. Knox Lake is known for its abundance of Walleye and Trophy Northern. 40 inch plus northern have been caught on Knox lake. Robert Lake is known for its abundance of Perch, Walleye and Trophy Northern. The portage lakes accessible from Robert will provide plenty of fishing excitement for those adventurous types. Job lake has both trophy walleye and trophy northern. Job lake has produced many of the largest walleyes caught in recent years. In addition to numerous walleye and Trophy Northern, Thicketwood lake is also known for its smallmouth bass. Murdock lake is known for its abundance of Walleye and Trophy Northern. You'll find trophy Northern and countless walleye on our 7 remote lakes located in the Canadian wilderness. Our modernized fly in outposts are fully equipped for parties of up to 8 people and include on-demand hot water units and solar power systems to provide first class wilderness accommodations. All of our camps are equipped with 14-foot fishing boats powered by 9.9 horsepower outboard motors, in the unlikely event of a motor malfunction we do provide a spare motor at each camp. Unlimited outboard gas is provided as part of your package. We strive to provide our guests with the best fishing experience the Canadian wilderness has to offer and invite you to enjoy the fly in fishing trip of a lifetime. You will tell tales of your fly in fishing trip in Ontario for years to come. 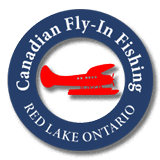 Call 1-800-445-4624 or email josh@canadianflyinfishing.ca to inquire about our current availability. Plans without dates are only dreams. Call us today to book your Canadian Fly In Fishing Trip.